Monrovia, Liberia - With morals fast degenerating and many harboring unacceptable social behaviors, the President of the Republic, George Manneh Weah, is concerned and cautioning Liberians against being disrespectful and hateful of one another. The Liberian leader, specifically referring to young people, said attitudes and behaviors towards parents, elderly people and national leaders largely determine one’s success in life; something he said is one of the secrets of his success, including being President of Liberia. He cautioned Liberians against indulging into hostile and intolerable behaviors incompatible with acceptable social norms, particularly the tendency of showing disrespect for parents, elderly people and national leaders. The President spoke Sunday, February 3, 2019 at the City Hope International Church in Oldest Congo Town. He expressed disappointment about the spree of unprecedented disparagement and utter disrespect being shown against parents, the elderly and those in authority by some citizens, unfortunately including the so-called elites and educated persons. He said it was unfortunate that even people who are calling for Liberia to be declared a Christian State are amongst those obeying the simplest commandment of the Bible regarding respect for fathers and mothers. 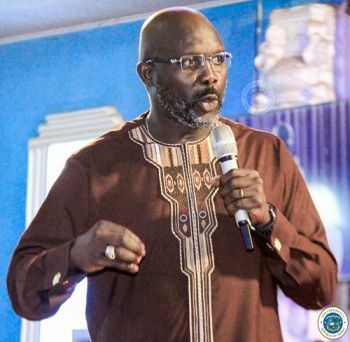 Making specific reference to recent barrage of insults rained at Archbishop Isaac S. Winker of the Dominion Christian Church over his prophetic assertions made a fortnight, President Weah stressed that parents, elderly people and national leaders deserve the respect of their people at all times. “My success in life, including becoming president, is due to my love and respect for constituted authorities, for the state and fellow citizens,” the Liberian Leader noted. President Weah however admonished the opposition to learn from his compassion and example, beginning from 2005 to 2011 when he unsuccessfully ran twice for the Liberian leadership without agitating. The Liberian leader decried such deportment and appealed to Liberians to desist, learn to respect mothers and fathers, elderly people and national leaders, as he did for 12 years while in opposition. The President thanked the leadership of City Hope Church for the honor. He also admonished them to take hearts in overcoming some of those problems.